Gaming in literature tends to come in two varieties; the high-brow and highly abstract, and the demotic and irredeemably nerdy. Look to puzzles in Perec’s Life, A Users Manual or chess in Nabokov’s The Luzhin Defense, for the former, and sci-fi literature for the latter. Historically-based wargaming has largely fallen through the gap; there is Uncle Toby and Corporal Trim’s effort to recreate the siege of Namur in Tristram Shandy but otherwise it is a hobbyist corner given little literary attention. Until, oddly enough, Roberto Bolaño’s latest exhumed English translation, The Third Reich. This novel, to be clear, takes its name not from that short-lived empire, but from a multiplayer strategy game depicting its span, of which the book’s protagonist is an avid devotee. Udo Berger, vacationing on the Catalan coast with his girlfriend Ingeborg, is not particularly given to sunshine. He spends much of the novel in his hotel room, unfurling scenarios for “The Third Reich” and soon launching into a fraught match with a local. Reviewers of the novel, written in 1990, but released in an English translation late last year, seem to be at some loss to describe just what, in fact, Berger’s wargaming constitutes, with most quickly settling upon the notion that it is “obsessive.” That’s not inaccurate, but it’s a sort of obsession rendered by a clear kindred spirit, with a detail of gameplay description impossible to anyone who wasn’t deeply familiar with the topic. Bolaño, a known enthusiast for these very games (which also cropped up in his Nazi Literture in the Americas), clearly was. It wouldn’t be unfair if this brings to mind the minutiae of role-playing gaming, with one crucial difference: the referent for historical gamers, however quixotic in practice, is history itself, not, say, the Star Wars C-Canon (the third level of verisimilitude in the Star Wars universe). Games invariably include design notes about historical accuracy and many feature separate simply historical accounts of the events depicted. In early years, Avalon Hill advertised a beribboned military advisory staff (featuring Gen. Anthony McAuliffe, of “Nuts” fame at the Battle of the Bulge) and provided a forum for heavily footnoted historical arguments on gaming accuracy in its monthly magazine The General. There, arguments over scenarios, tweaks, and historical fealty unfolded, issue after issue. If sci-fi gaming offered countless occasions for spiritual and factual improvisation, board wargaming is a realm for high-church scriptural literalists. In any deployment the strongest hex will be the one where the English armored corps is located, whether P23 or O23, and it will determine the focus of the German attack. This attack will be carried out with very few units. If the English armored corps is in P23, the German attack will be launched from O24; if, on the contrary, the English armored corps is in O23, the attack must be launched from the N24, through the south of Belgium. At first he learned to replay the immortal games that remained from former tournaments — he would rapidly glance over the notes of chess and silently move the pieces on his board. Now and then this or that move, provided in the text with an exclamation or a question mark (depending upon whether it had been beautifully or wretchedly played), would be followed by several series of moves in parentheses, since that remarkable move branched out like a river and every branch had to be traced to its conclusion before one returned to the main channel. Luzhin’s father, aware of these locked-up hours, comes to suspect that Luzhin is “looking for pictures of naked women.” Undistracted calculations of such sort are essential to any complex game; it is a solitary vice which would no doubt be more easily understood were it lubricious. Berger, though, as indicated, is more than an ordinary player, and while he plots inside, his girlfriend, Ingeborg, takes up more conventional frolics, in the company of another German couple, Charley and Hanna, and itinerant Spaniards known as the Wolf and the Lamb. Soon Hanna shows up with a black eye, suffered at Charley’s hand, and Charley simply disappears. In the aftermath of the investigation of his disappearance both Ingeborg and Hanna depart; Udo stays on beyond the term of his vacation, in a morbid wait for Charley’s corpse, intensifying a flirtation with the wife of the hotel’s owner, growing increasingly curious about the reclusive ailing owner, and drifting into a game of “The Third Reich” with El Quemado, a laconic and severely burned beach paddleboat renter. Udo, unsurprisingly, first routs the amateur El Quemado, “He doesn’t know how to stack the counters, he plays sloppily, he has either no grand strategy or one that is too schematic, he trusts in luck, he makes mistakes in his calculations of BRP, he confuses the creation of units phase with the SR.” And yet soon this formerly abstracted game takes on a very personal charge, as Udo’s macabre wait for a corpse continues. Udo, along the beach one evening, overhears someone providing El Quemado advice on the game; a figure he suspects is the hotel owner, who he suspects is opening a second front, as it were, in response to Udo’s flirtations with his wife. Thus, Frau Else’s husband has news of me from two sources: El Quemado tells him about the match and his wife tells him about our flirtation. I’m the one at a disadvantage; I don’t know anything about him, except that he’s sick. But I can guess a few things. He wants me to leave; he wants me to lose the match; he doesn’t want me to sleep with his wife. The Eastern Offensive continues. The armored wedge (four corps) meets and pierces the Western front at Smolensk, then goes on to take Moscow, which falls in an Exploitation move. In fact, Berger declares that he’s “more like an anti-Nazi” and we’re given no reason to doubt him whatsoever; that said, it’s no surprise that the enthusiasm of a German for steering Germany would raise eyebrows. This brings to the fore the aspect of gaming that Bolaño exploits most deftly: the almost unavoidable historical romanticism that attends most wargaming. Is this something only a German would do, a sign of some latent crypto-fascism? No, it’s something that countless wargamers do, and nothing unusual in a recreation reliant upon the approximated capacities and skills of very real former generals, units, and armies, about whom there are countless very specific monographs published each year (conduct an Amazon search for upcoming history books; the number of volumes on military history is typically only slightly below the number on American history). Ambrogio Spinola’s actual function in a battle might be to provide an outflanking factor of 6, but he’s also the victor depicted in Velazquez’s “The Surrender of Breda.” Albrecht Von Wallenstein may prove functionally inferior to Gustavus Adolphus in leadership points, but he’s also the subject of three Schiller plays; background that one does not simply forget. Berger, of course, takes this a bit father. If El Quemado had the slightest knowledge or appreciation of twentieth-century German literature (and it’s likely that he does) I’d tell him that Manstein is like…Celan. And Paulus is like Trakl, and his predecessor, Reichenau, is like Heinrich Mann. Guderian is the equivalent of Jünger, and Kluge of Boll. Is this typical? Well, no, it is mildly absurd, and yet a sense of just where Berger’s enthusiasm rests offers a captivating puzzle; is this crypto-nationalism or is it merely gaming ad absurdum? At one point, Else asks “And what does it mean to be German?” Berger responds, “I don’t know exactly. Something difficult, that’s for sure. Something that we’ve gradually forgotten.” Is this an effort to construct some untroubled national identity through fantasy, to reconstruct devastation into art, reducing war to its tactical essence and leaving out anything that is unsavory? Perhaps. Whatever the case, it’s been a pursuit with essentially no consequence — until the game with El Quemado begins and Berger begins to suspect that darker consequences may loom. It’s clearly not unusual to append dire consequences to the outcome of a game; one can always play chess with death. It is unusual to align these antagonists with any sense of national identification; most games do not lend themselves to the practice. A German playing Germany in a World War II simulation makes for a far different landscape, however. And whether Berger’s fears are those of a fantasist recluse imagining threats or of a suppressed recidivist realizing that refashioning history might have some consequence is a tantalizing question, all made possible through Bolaño’s superb exploration of just what conflating these two tendencies might produce. 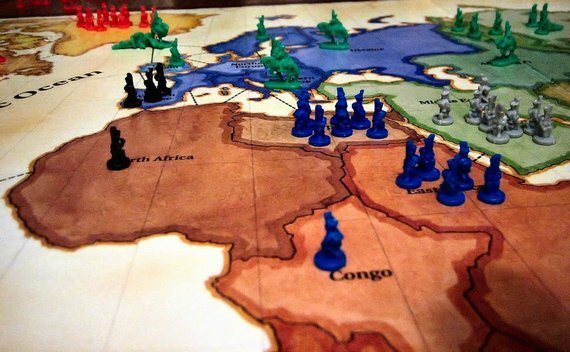 An attack on Moscow might merely involve a roll of the dice, but it might involve quite more.